Seeking an enchanting getaway with friends? A place that has engrossing activities, exceptional food, creative shopping opportunities and lovely scenery? A weekend in Abingdon, Virginia, can leave you and your friends feeling invigorated and refreshed. Visitors will find both outdoor attractions that highlight the incredibly scenic mountains of Southwest Virginia and some of the region’s best music, theater, and other cultural attractions. Throw in one of the state’s most historic inns and you’ve got everything you need for a memorable getaway. 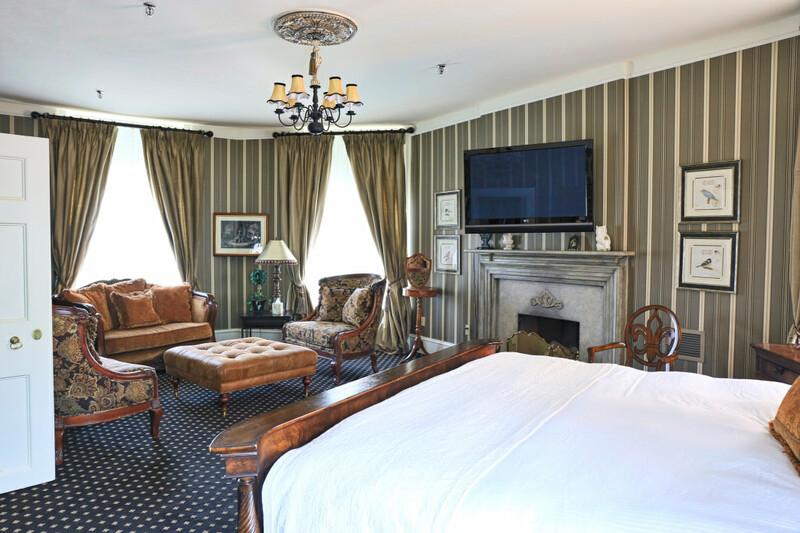 Start with the perfect accommodations—The Martha Washington Inn and Spa, an historic Four Diamond-rated property located in the heart of downtown Abingdon. After you arrive, relax on the hotel’s expansive porch with a drink. After cocktails, walk to dinner at 128 Pecan, a Southern-style American bistro for a casually elegant dining experience. The restaurant serves a wide array of local wines and teas and small plates perfect for sharing. After dinner, head over to The Barter Theatre for a show. The Barter opened on June 10, 1933, making it the nation’s longest running professional theater. It’s so named because during the depression when money was tight, the theater’s founder allowed patrons to enter by bartering food, livestock or other goods. For 40 cents—or the equivalent in goods—you could enjoy a live show. In 1946, it was designated as the State Theatre of Virginia, and it’s one of the last year-round professional resident repertory theaters remaining in the country. Today it’s packed season offers musicals, comedies, and dramas—there’s something to see nearly every day on two different stages. Saturday morning, get a jump on the day, with some laps in The Martha’s therapeutic heated, salt-water pool, kept at the perfect temperature for a loosening up of those tired muscles. Now you’re ready to take on the hotel’s traditional Virginia hot breakfast included in your room rate. The menu features pancakes, waffles, eggs, Virginia Ham, breakfast potatoes, pork sausages, bacon, grits, pastries and the chef’s fruit smoothie of the day. Schedule one of The Martha’s legendary spa treatments, choosing among a hot stone massage, botanical skin resurfacing, or aromatherapy soak. Another option is the Healing Waters Day Spa, which caters to groups and features holistic and Ayurvedic practices, along with personalized service. Girls Day Out is a package that allows you and your friends to relax together in robes, enjoy lunch and try out the steam room and sauna. Check out their Godiva’s Delight package, which begins with a visit to the steam room followed by a Body Polishing Exfoliating Massage Treatment. Godiva’s Delight ends with a mini facial and hydrating hand treatment. 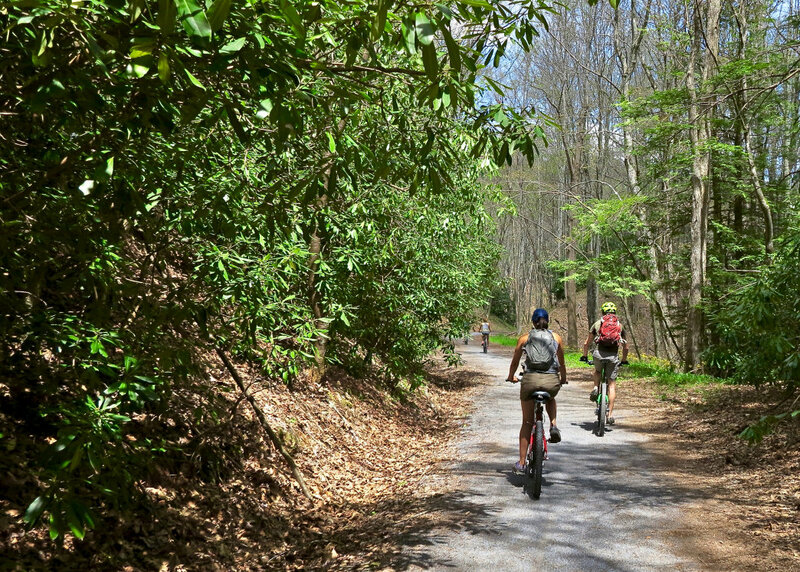 Game for a bike ride along the renowned Virginia Creeper Trail? The 34-mile trail is one of the best rails-to-trails in the country. The former railroad tracks were transformed into this running, hiking, and biking path, which stretches from Whitetop Station near the North Carolina border to Abingdon. The Virginia Creeper Trail Bike Shop is just a few blocks from The Martha at the terminus of the famous trail. Rent a bike there and you can take an easy ride on the trail, or take a shuttle to Whitetop Station and enjoy a mostly downhill ride to Damascus or all the way back to Abingdon. Along the way, you’ll see some of the prettiest scenery in the area, including trickling waterfalls, roaring rivers and thick forests. For anyone who enjoys cycling, it’s a must-do ride when you’re in town. If yoga is more intriguing to you, take a class at Whitetop Yoga, located in downtown Abingdon. Catering to every skill level, this beautiful and serene studio is a great way to stretch and meditate with experienced instructors. 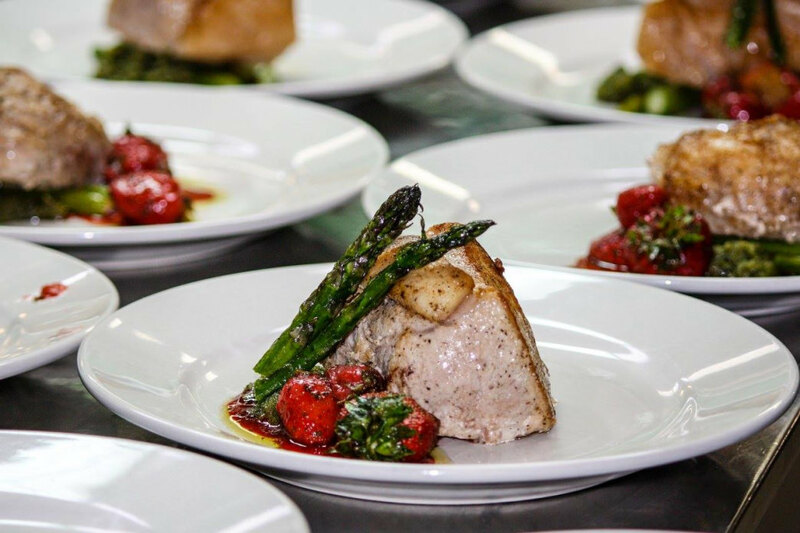 Take a drive to Harvest Table, the restaurant owned by bestselling author Barbara Kingsolver and her family, which moved to the region seven years ago and began farming—a calling that inspired Kingsolver’s book Animal, Vegetable, Miracle. On the forefront of the local food movement, the family serves dishes created from the bounty of local farmers who harvest their produce and raise their animals according to Appalachian heritage farming techniques. Their $50 per person farm tour includes a look at their sustainable practices, a multi-course chef-selected menu and signed copy of Kingsolver’s book. Another foodie option is The Market, a new café that was formerly Allison’s Diner on Lee Highway. The young owner showcases products from Southwest Virginia’s abundant farms, including fresh breads, recently harvested produce, and grass-fed beef. You won’t want to miss out on Abingdon’s weekly Farmers Market on Saturdays, where you can pick up seasonal produce, jams, horseradish, honey, eggs, molasses and other treats. From April through Thanksgiving, the market is outdoors, but moves inside, turning into a Winter Market in December. Abingdon Market is a great place to find gifts such as goat milk soaps, dried flowers, Virginia peanuts, soy candles, and pottery. Appalachian mountain artisans sell their hand-crafted alpaca woolen mittens and hand painted wine bottles there, too.Sometimes you’ll catch musical performances, cooking demonstrations and festivals on the grounds of historic Fields-Penn House. What’s a rejuvenating weekend without a little shopping? Downtown Abingdon’s Persnickety boutique offers a curated selection of fashion forward designer clothes and jewelry you might not expect to find in a small town. Don’t miss their French vintage medallion necklaces. Down the road, the Forget Me Not shop caters to the youthful and youthful at heart with exuberant tops, dresses and accessories. They also sell scented products, shoes, and boots. 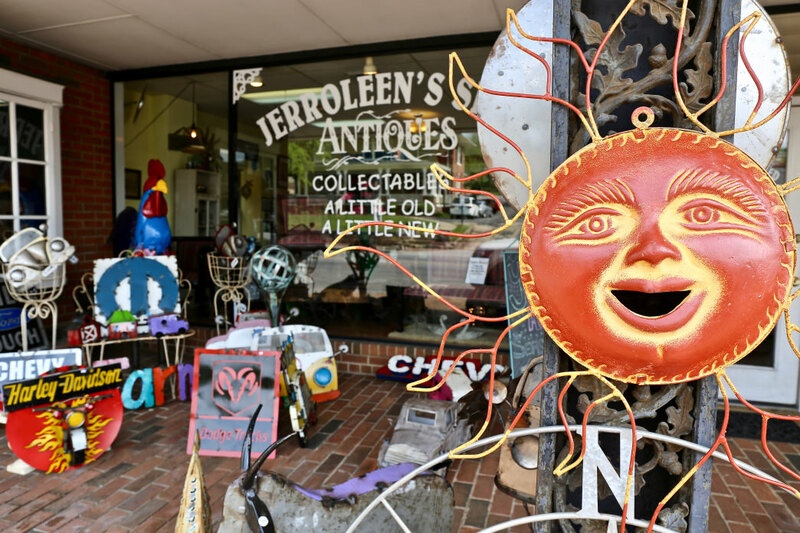 Abingdon is an antique and home decor lover’s dream with multiple stores stocking rare, vintage and reclaimed collectibles and gifts. Zephyr Antiques has an eclectic collection of period furniture, dishware, china, rare books, coins and other historic memorabilia. Jerroleen’s Shed stocks both old and the new merchandise, with whimsical furnishings that enchant every shopper. The Candy Shed carries a mouthwatering assortment of treats, from chocolates, Virginia peanuts, to colorful gummies and suckers—and they have samples. Abingdon is located in the heart of Appalachian Mountain country, and the town’s galleries showcase many fine examples of heritage crafts. Stop at Holston Mountain Artisans to shop for silk and alpaca woven scarves, patchwork quilts, hand-carved wooden boxes and wicker baskets to name a few treasures in this cooperative gallery. They also offer classes; so check the calendar in advance to see if your group wants to learn a new craft together. The Arts Depot is a gathering place for seven Resident Artists creating in a variety of mediums right here in their studios, including clay, paint, folk art and weaving. Many of their creations are available for purchase. Heartwood is Southwest Virginia’s Artisan Gateway, with a stunning selection of high quality fine arts, clothing, home goods, and furniture. While you’re there, grab lunch in the Heartwood Café and enjoy sweeping vistas of the surrounding mountains. No matter how you like to relax, you’re certain to find a way to do so in Abingdon.